We had a busy 2010! Below are highlights of our most prominent exhibitions and events last year. Looking forward to more exciting projects in 2011 . . . . 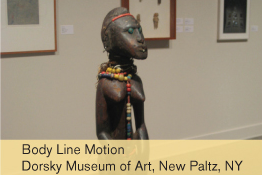 This exhibition included select works from the Museums permanent collection depicting human and animal forms that emphasize movement, dance, and ritualistic activity. It also addressed the influence of feminism and politics as well as the integration of multiple materials and media. Highlights include an Egyptian bronze cat, a pre-Columbian terracotta jaguar relief, a standing female figure from the Ancient Near East, and twentieth-century works on paper by Alberto Giacometti, Lee Krasner, and Robert Rauschenberg. Reviewed in Roll Magazine. 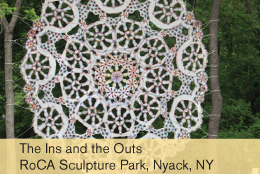 Outdoor sculpture park exhibition with artists Susan Benarcik, Jennifer Cecere, Ruth Hardinger, Larissa Killough, Melissa McGill, Leslie Pelino. 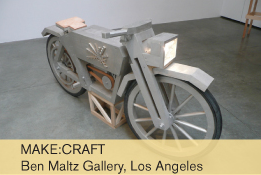 The six installations investigated and re-invigorated abstract sculptural forms with an emphasis on surface and made use of found materials such as plaster molds, food packaging containers, metal clothes hangers, lace, nylon, rope and used clothing. The works addressed interiority, containment or concealment, while at the same time demonstrating flexibility and transparency via the use of holes and openings. Suzanne and Mathilde Husky installed miniature "bonsai tree" sculptures made from sewn together used and recycled clothing inside a long bank of storefront windows where thousands of office workers stroll through everyday during their lunch break. 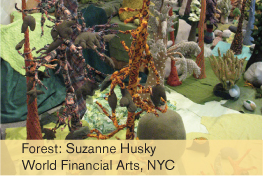 Curated in partnership with the World Financial Arts program. 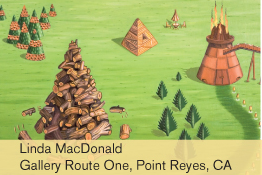 Solo exhibition featured in the Project Space entitled Stories from the North Woods including paintings and fiber pieces with graphic and animated imagery, symbols and layers of humorous narrative, addressing the artists' local environmental issues in Mendocino County. Many of these works commented on the physical and cultural byproducts of the Northern California logging industry and the vernacular of redwood tourism. 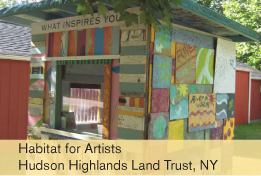 Habitat For Artists collaborative spent the summer working in studios hosted by the Hudson Highland Land Trust in Garrison, NY at their site at Philipsebrooke. These small studios, each only 6 x 6 ft, become an intimate workspace for the artists - but also act as a metaphor for viewers to contemplate how much space we really need in our own homes. HOW MUCH? HOW LITTLE? THE SPACE TO CREATE is the question HFA poses. Artists rotated over the course of the summer and included: Susan English, Sheilah Rechtschaffer, Carol Flaitz, Michael Natiello, Sarah Haviland, Marnie Hillsley, Kit Burke Smithe, Christopher Manning, Carla Goldberg, Dionis Ortiz, Todd Sargood and Simon Draper. The exhibition, curated by Jennifer McGregor, showcased artists’ projects that raise awareness about issues concerning watershed fragility, industrial and natural history, personal responsibility, and ecological balance. Included Lillian Ball, Jackie Brookner, Mags Harries and Lajos Heder, Natalie Jeremijenko, Patricia Johanson, Lorna Jordan, Matthew Mazzotta, Eve Mosher, Buster Simpson, Susan Leibovitz Steinman, Suzanne Lacy, and Yutaka Kobayashi, George Trakas and Mierle Laderman Ukeles. ecoartspace produced two video interviews with Patricia Johanson and Jackie Brookner which you can view HERE. Included artists/collaboratives: Roy Staab, Chrysanne Stathacos, Billy Blaise Dufala of RAIR collaborative, Simon Draper and Todd Sargood of Habitat for Artists and performance artist Chere Krakovsky. Each created temporary public art projects along the Manayunk Canal in Philadelphia. 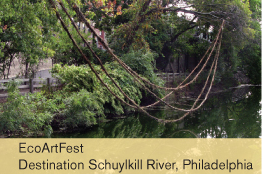 EcoArtFest opened in conjunction with Destination Schuylkill River, an NPO whose mission is to celebrate life along the river and to connect communities to the river through planning, programming and projects. 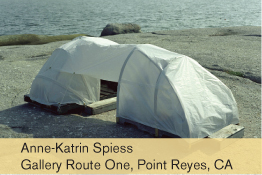 September 17-October 24, 2010Solo exhibition entitled Nothingness Projects/Journey to Green Horizons featured in the Project Space including works which Spiess had created from 2002-2003 on a barren island off the coast of Deer Isle, Maine. Her work reveals connections between art and survival, survival as creativity through ritual activities, or Nothingness Projects, documented with photographs and video. 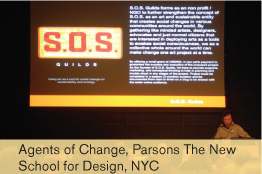 Survey of contemporary artists presented at the Otis College of Art and Design who combine hand making and building techniques to create or engineer unique, mostly functional devices, objects, and machines; making either a social/political statement, creating new markets for individual styled products, or inventing ways to experience the tactile world, non-virtual, the “real.” Included makers Kim Abeles, Jonah Brucker-Cohen, Frau Fiber, Garnet Hertz, Justseeds Artists’ Cooperative, Seth Kinmont, Liza Lou, David Prince, Mark Newport, Alyce Santoro, Shada/Jahn (Steve Shada and Marisa Jahn), Eddo Stern. 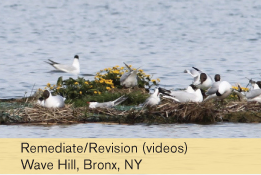 EcoArchive: Mediations on Time and Nature challenges us to step outside of our daily experience, to consider on a deeper level the forces that shape the natural world, and how time collapses as we move into the future. Co-curated group exhibition with photographs, video, sculpture by Sam Easterson, Karl Cronin, Cynthia Hooper, Chris Sicat, Matthew Moore, Chris McCaw, Jessica Skloven, Tamara Albaitis and Mark Baugh-Sasaki. Agents of Change: Artists and Sustainability was a panel discussion including Brandon Ballengee, Jackie Brookner, Eve Andree Laramee, Stacy Levy, and Tattfoo Tan, each explore issues of sustainability and ecology often to create community-based or public art projects. Moderated by Amy Lipton and Patricia Watts. 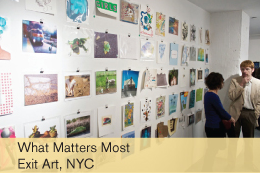 Co-hosted by ArtTable, ecoartspace, and the Shelia C. Johnson Design Center. In conjunction with the exhibition Living Concrete/Carrot City.